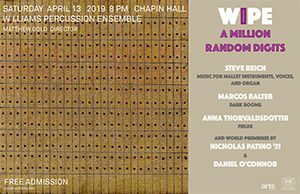 The Williams Percussion Ensemble (WiPE) offers its spring concert, A Million Random Digits, The program is centered on large-scale masterpieces for percussion. Steve Reich’s Music for Mallet Instruments, Voices, and Organ (1973) features marimbas, vibraphones, glockenspiels, electric organ, and voices pulsating with rhythmic drive. 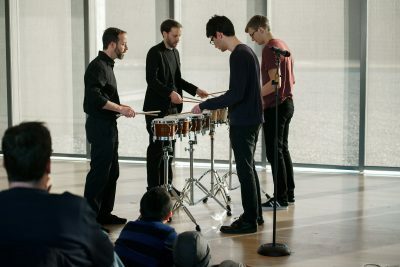 Marcos Balter’s Dark Rooms (2007) is a five movement work for quartet that explores numerous percussive sounds like scratches on drum heads and strips of paper, the moaning sounds of wooden planks, as well as the various sounds that can be made on cooking pots and other found sounds. 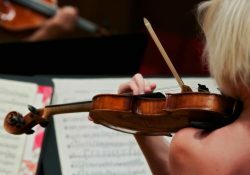 An influential young composer of today, Anna Thorvaldsdottir, is known for music of extraordinary color and texture. Her work, Fields for chamber ensemble and electronics explores the expressive qualities of feedback and white noise, tranquilly evoking the expanses of her native Iceland. 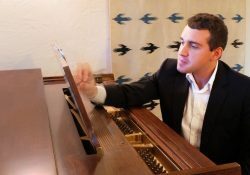 WiPE’s spring program also features two world premieres by ensemble members, Nicholas Patino ‘21 and Daniel O’Connor. 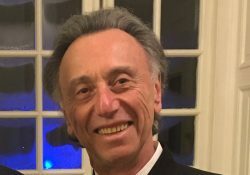 Patino’s new work presents the ensemble playing tight grooves and intricate patterns, while O’Connor’s Gloaming round envelops the audience in delicately rubbed drums and gently rippling rhythms. For this concert WiPE is configuring the Chapin Hall stage so that the audience is seated on stage, around the ensemble. This program will run approximately 75 minutes with no intermission.